Every student shall abide by the rules laid down by the college and shall be responsible for maintaining the discipline of the college. It is expected that every student will maintain dignity an decorum expected of a law student. Every student shall be provided with an identity card and he/she shall produce the same at the time of borrowing library books, to obtain no due certificate, and in the examination hall or at any times as and when required. Every student shall regularly attend the classes. Every student shall pay prescribed fee and other dues within th prescribed period. Loitering around the college when the classes are going on, shouting and isturbing classes, damaging the college property and indulging in physical violence with fellow students are treated as acts of grave indiscipline and such students found guilty of misconduct are liable to be rusticated. 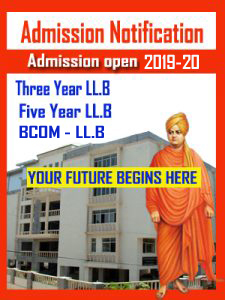 No students shall indulge in, encourage or abet any form of malpractice connected with examinations or any other activity of the college. No student shall organize any tour, picnics or any meeting either in the college or outside the college without the express permission of the Principal. Students can proceed on tours/picnics/study tours only after producing written consent from their parents. Parents are expected to meet the principal concerned teacher whenever required, failing which the student may be discharged by the college. Elections will not be held for formation of Students Association. Students can make use of the good collection of books and journals in the library. Any loss or damage to the books borrowed shall have to be made good by the student either by replacing the book or paying the costs prescribed. Reading room facility is also available. In case of loss of identity card, a duplicate card will be issued on payment of a prescribed fee. Students are advised to watch the college notice board regularly for announcement of class tests, terminal examinations, special classes, functions, award of scholarships, student-aid fund, attendance shortage and any other useful information and activities. Failure to do so cannot be claimed as an excuse, for loss or any benefit. The Institution will in no way be held responsible for any such loss.